When we heard Frank Bonanno had been named 2012 Vetrepreneur of the Year by the National Veteran-Owned Business Association, we had to catch up with him to find out what else he's been up to since we last profiled him in this magazine 2 years ago (3rd quarter 2010). Bonanno, now 70, says he was honored to receive the annual award, which recognizes the finest role models in the veteran-owned business arena. And though he admits to "slowing down a little," Bonanno says he has no plans to exit the business quite yet. How could he? 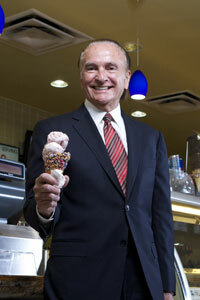 His business has grown to include 47 franchised locations employing more than 700 in the Las Vegas area. That qualifies him as a "dominator" by any standard. His brands include Nathan's Famous restaurants, HÃ¤agen-Dazs, Johnny Rockets, and four Bonanno's New York Pizzeria restaurants, just to name a few. The New Jersey native says his love of food and cooking trace back to growing up in an Italian-American family. On his route to his present-day success, Bonanno earned a degree from a culinary institute and worked in restaurants before joining the Army during the Vietnam era. After serving for three years, he was honorably discharged and rejoined civilian life in California in 1970, where he went to work for ARA Services (now Aramark). He made his way back to New Jersey, and by 1974 had teamed up with two like-minded associates to form a business that contracted food delivery services with area schools. The team prepared food, delivered it, and handled all the back-end management. "We were working 90 hours a week, but we enjoyed what we were doing," he says of those early days. Perhaps his biggest break came in 1976, when the partners formed Fairfield Foods, Inc. and began opening cookie shops in malls across the country. "That company did very well, and we eventually built it up to a chain of 75 locations. We never did franchise it--in fact, I've never been a franchisor--though there was a lot of interest. We chose to keep the stores company-owned, and we sold it in 1984 to Mrs. Fields," he says. Meanwhile, the busy trio had also opened their first HÃ¤agen-Dazs franchise in 1983 "just for fun," he says. "We'd researched HÃ¤agen-Dazs and found it to be the best product out there." In 1989, he bought his first Nathan's Famous franchise. Bonanno, who had been building his business primarily in the Northeast and Florida (where he was living), also had been traveling to Las Vegas for vacations and the potential opportunities there were evident. His inaugural foray into Vegas was a restaurant in the food court of the then-new MGM Grand in 1993. "Once in the hotel, we found we were doing three times the volume we'd projected for these units. We weren't used to those kinds of numbers," he says. So naturally if one unit worked this way, they thought, why not two, three, or more? In 1998, they opened their first original concept, Rosie's Pizzeria, in two small casinos. The next year they opened another new restaurant, San Gennaro Grill, as well as another HÃ¤agen-Dazs in The Venetian. Next came New York Pretzel, and the hits just kept on coming. Following the 9/11 tragedy, his one remaining partner retired. Bonanno bought out his share of the company and moved to Las Vegas to manage his growing company full-time. He added Johnny Rockets to his portfolio in 2007, then opened his first full-service restaurant, Trattoria Reggiano, in The Venetian. By 2009, he was developing and managing entire food courts at large hotel-casinos. Part of his secret was his formula of mixing franchised brands with his original concepts. Since we last spoke with Bonanno in 2010, his Fifth Avenue Restaurant Group has taken on a new partner of sorts--his wife, Betty. Their children are now older and more independent, which has freed up Betty to be a "goodwill ambassador" for the company. "Betty is active in a number of Las Vegas-based charity organizations, including serving on the board of the Las Vegas Animal Foundation, and also works closely with the Las Vegas chapter of JDRF (Juvenile Diabetes Research Foundation)," he says. "Las Vegas is a very charitable city, and the hotel and casino industry is an important part of charitable giving there, which makes her involvement a major asset to our business relationships." Their eldest son, Robb, 36, is expanding his role within the company. "Now, in addition to managing a team of six executives who oversee the day-to-day restaurant operations, he is also heavily involved in real estate selection as well as planning, design, and construction of new restaurants," says Bonanno. Busy? That's an understatement. Since 2010, Fifth Avenue Restaurant Group has developed and currently operates food courts at the Flamingo and Palace Station; has remodeled the food courts at the MGM Grand and Luxor; and is developing a new food court at Bally's and remodeling the food court at Mandalay Bay (both expected to open in the first half of 2013). They've also launched a new proprietary concept called Original Chicken Tender with a location at the Luxor and one at the Monte Carlo. And two more new concepts are on the way: a pizza-by-the-slice concept and a full-service Italian restaurant, streetside on the Las Vegas strip directly adjacent to CityCenter, a mixed use 10,000-room complex featuring the Aria Resort & Casino, Vdara Hotel & Spa, Mandarin Oriental Hotel, Veer Towers, and the 500,000-s.f. Crystals shopping, dining, and entertainment center. He says it's a great location, and also adjacent to Planet Hollywood and the Cosmopolitan. Hard to believe with all of this going on, but Bonanno says he may begin to slow down a bit and work fewer days and hours. However, he also recognizes that he has a business to take care of and pass on to his children--and he obviously still loves working, growing, and building his organization. No. of units: Franchised: 13 Nathan's Famous, 9 HÃ¤agen-Dazs, 5 Johnny Rockets. Proprietary: 4 New York Pretzel, 4 Bonanno's New York Pizzeria, 2 Rosie's Pizzeria, 2 Original Chicken Tender, 2 L.A. Subs & Salads, and 1 each of NYP Pizzeria, San Gennaro Grill, Trattoria Reggiano, Asian Fresh, Pan Asian Express, Bella Panini. Family: Wife, 4 children, 1 daughter-in-law and 1 granddaughter. Key accomplishments: Served as officer in U.S. Army; founder of Fifth Avenue Restaurant Group, which has become the largest quick-serve restaurant company in the Las Vegas hotel/casino market. Focusing our business on the Las Vegas hotel/casino market. I don't have a typical day, I spend my time between office, restaurants, and business meetings. Five to seven days, depending on workload; typically 60 to 70 hours. 3 to 5 days per week, mostly aerobics. Trade magazines, Time, and any John Grisham novel. Do you have a favorite quote/advice? Don't think you are smarter than everyone else. Having the responsibility to raise a family. I work long hours, but manage to take numerous family vacations when the children's schedule allows. Take care of our employee family and they will take care of our customers. Customer service business. Without our customers there is no business. As an operator, what are the two most important things you rely on from your franchisor? Brand recognition, and maintain a high level of quality throughout the franchise system. The excitement of growing our business. To provide the highest level of customer service and serve the highest-quality products. Empower employees to take care of customers without needing to ask superiors. Convincing 100 percent of our employee family of the importance of our company culture as it relates to our guests and our food products. Each of our restaurants is managed by a managing partner (general manager) who reports to an area VP or district manager who then reports to our executive VP who then reports to me. No, we rely on hotel/casino traffic and the major Las Vegas hotels have adjusted room rates, which helped maintain steady traffic. I hope that others feel I am easy to get along with. We hire based on past performance, how long an individual held past positions, and if we can determine if the individual has a passion for excellent customer service and high quality. We fire with difficulty; everyone deserves a second chance. We insist on a drug-free environment. All of our potential employees must pass a drug test and police background check. They also are required to attend a food handler's class as well as attend our corporate safety program. All of our new hires must go through a formal training program for their intended position. Our policy is to document all issues so that there is no misunderstanding. 20 percent growth in number of operating units. We would be satisfied with a 10 percent growth in volume each year. The affect has been minimal. Hotel/casino guests are able to get great deals on hotel rooms compared with 2004, 2005, 2006 and 2007. These guests are also looking for deals on restaurants as well, and our quick-serve restaurants offer the most reasonably priced food offerings in the hotels. Our particular niche has remained steady. We forecast level traffic patterns. Private equity and local bank financing. Yes. Our balance sheet is improving each year. Private equity and local banks; great returns for private investors and the local banks understand our business model. To some time in the future (I hope not too soon) pass the company on to my children. We offer company-sponsored medical plans, a liberal vacation policy, and bonus based on profits for all members of our management team. All employees enjoy a 5-day work week with two consecutive days off. Hourly team members also have the option to purchase health insurance through a company-offered program. Hourly employees' starting compensation is 50 percent higher than minimum wage. We face the same issues as the industry. Whenever possible we promote from within.